When this blogger needed a spot to unpack boxes of books after a move, she decided to create a library shelf from plywood boards. Why buy when you can DIY like this? When we saw Ama’s sleek and contemporary bookshelf, we were impressed. And when it became clear that it was made entirely out of plywood, we were doubly so. Her project, which we came across at Oh Oh Blog, is proof that humble materials need not be relegated to lowly status. 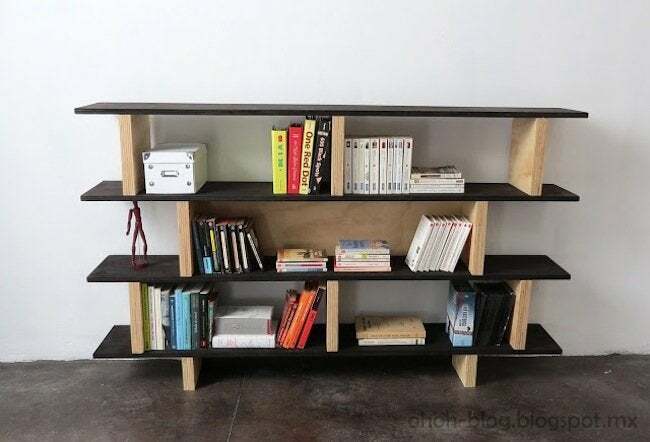 In fact, after seeing this bookshelf, we think plywood deserves a second look. Here’s how she did it. 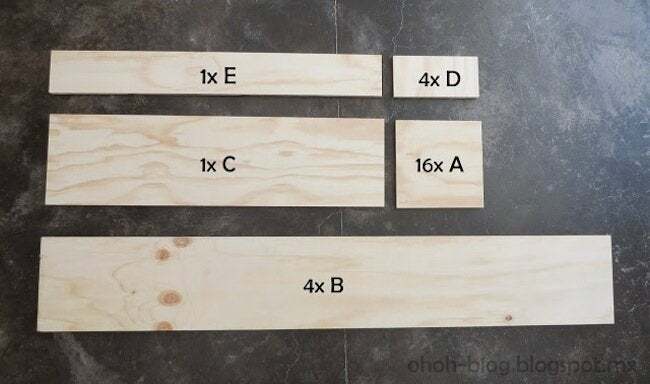 Cut the plywood boards (or have them cut professionally) using the following dimensions. Glue the “A” pieces two by two to make the vertical parts. I used wood glue and clamps to hold them together until it was well stuck. I sanded all the pieces, flat and edges (booooring part). I stained shelves in chocolate color and applied transparent varnish on the other pieces. I like the contrast between the two colors. This can work with any other colors combinations—give it a try. I assembled the D and E pieces to make the base of the bookcase. You have to put the D pieces perpendicular to the E piece, put some glue between the pieces, and then fasten with two screws on each side. After that, I attached three A pieces to a B shelve. I put glue on the shelf and laid the A above, making sure they were vertical. Almost done! We can start to assemble the shelves. Put the base on the floor, add some glue and put a shelve on top. Use clamps or weights (like books or tool box) to ensure a strong bond. 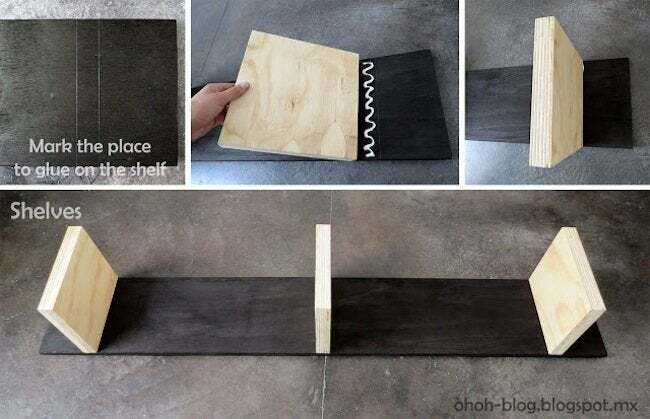 Then add glue and put the other part on top, and so on… until the last shelf! Thanks for sharing, Ama! To see even more incredible DIYs, visit her at Oh Oh Blog.